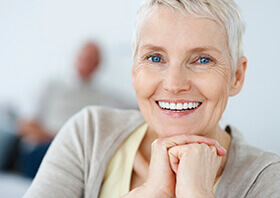 A partial denture, commonly referred to as simply a partial, consists of multiple teeth on a gum colored base. The teeth are not in a row, but rather spread across the base to fit like a puzzle with your existing teeth. A partial is normally secured with clips or brackets, but unlike a bridge, a partial is removable. Our clips and brackets are custom designed to blend with your natural teeth and gums, making them virtually undetectable.